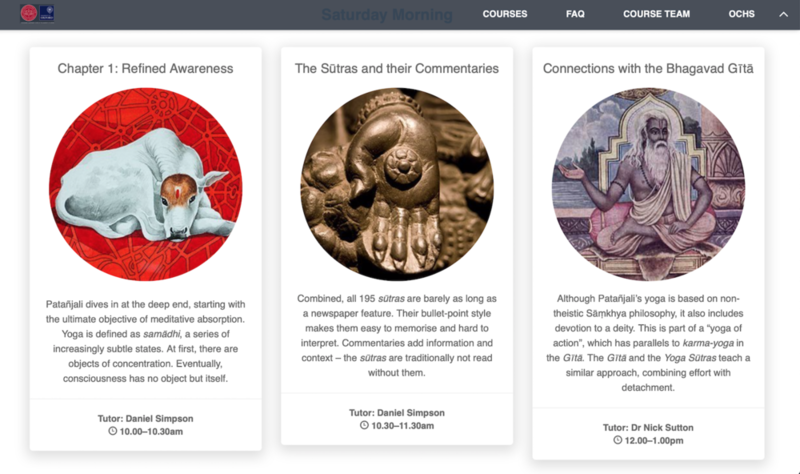 I’m co-teaching this course on Patanjali’s sutras, traditional commentaries and modern applications. It’s a great opportunity to focus in depth on foundational aspects of yogic philosophy, to ask lots of questions and meet fellow students. This might have added appeal if you’ve already taken an online course through the Oxford Centre for Hindu Studies. There’ll be two full days of teaching in central Oxford, with a range of presenters from the OCHS, including my colleagues Nick Sutton, Jessica Frazier and Karen O’Brien-Kop. There are also guest contributions from Valters Negribs (on the yoga of contentment), and Sanskrit chanting with Gabriella Burnel. The Yoga Sutra is often described as the foundation of yoga practice. This weekend of interactive discussions with scholars and practitioners explores the Yoga Sutra’s relevance to 21st century yogis. How does it relate to modern yoga? What does it really say about postures? What goals does it define? The course includes a free copy of Nick Sutton’s translation, which we’ll read along with other editions. I hope to see you there!